Most of the stories collected here share genre and format, the tales told through the dual lenses of horror and dark fantasy. They are also largely literal in their interpretation of the monstrous: all of the monsters contained in the book are very real both in the folklore and in their roles within the story, rather than being symbolic or metaphorical. The volume has black and white illustrations throughout, and most of its sixteen contributions are short stories, with no poems and only two entries that are fully graphic in form: ‘The Death of One’ by Su Opperman and ‘A Divided Sun’, written by James Bennett and the artist, Dave Johnson. Opperman’s story is characterized by its use of ink, here suggesting watery blurs for rainstorms, there economical brushstrokes for birds and other animals. Barring the use of written sound effects (‘Tok! Tok!’ ‘Slap!’), it contains only a single complete line of dialogue scattered across the panels of a violent struggle: ‘The death of one is… life to the other’ (59). It is telling that only when representing humanoid figures do the images become rough and violent, replaying a struggle between a ‘man’ and a ‘monster’ that ends with a ‘To be continued’ despite being a clear ending: it’s an immortal, primordial battle. In contrast, Bennett and Johnson’s narrative concerns a young English boy named Bobby who moves to South Africa with his father in the 1980s. The clashes of Apartheid contrast with the casual violence of bullying schoolboys, and in a happenstance encounter with a shaman, Bobby has a crucial realization: ‘He sees a divided sun. He knows it shines differently on him than the other people here. He stands in its light while people who dream and breathe just like him stand in the dark’ (194). This is the volume’s conclusion, but it hints at a thesis, which is that humans can be as monstrous as, well, our traditional monsters. This is not new territory, but by transparently connecting it to race and diaspora, it does push the issue forwards more aptly. Humans can’t make sense of the monstrous, or the supernatural. Perhaps that is the key to monstrosity itself. This is a very strong collection, and I enjoyed its contributions. However, if the book has a weakness then it is the concrete cultural sensibility of the monstrous in this specific context: Going in with no prior knowledge of African monsters myself, I felt that a lot of the subtleties of the texts went right by me, and were only partially remedied by some internet research after the fact. As such, there was a kind of sameness to many of the stories: A monster would appear, bad things would happen. I felt like this could have been mitigated with just a couple of lines introducing the stories’ content and giving them a sense of place. While several stories directly referenced specific cities like Johannesburg, most did not, and the notes on the contributors at the end similarly only sometimes mentioned where they live or came from. As such there is an element of disconnection to the texts for the unfamiliar reader; ‘Africa’ remains rather abstract. This could have been easily mitigated with only a couple of words, or even section headings between sets of stories. I hope this is something that might be taken into account for future volumes to aid the reader. 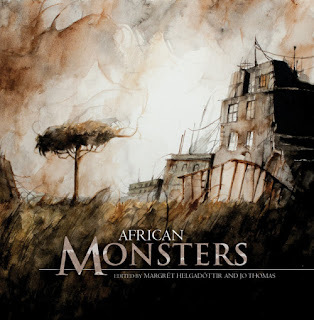 I would consider African Monsters to be something of an exploratory volume: readers will get the most out of it if they go in wanting something different, rather than just a preconceived idea of genre or of monsters themselves; it is definitely not material that will be found commonly while casually reading through other collections or magazines. And while some of the stories wrangle with issues of colonialism, most of the stories take place in the present day, showing a contemporary, lived-in space that is seldom seen by most of the West. Reading it was a treat, and I look forward to future entries in the series.